The researchers say the experiments advance the search for improved implantable devices able to treat chronic pain that is due to peripheral nerve injury or disease. "We have developed a potential new concept for neural implants that works differently than conventional electrical stimulators," says Gene Fridman, Ph.D., M.S., assistant professor of otolaryngology–head and neck surgery and biomedical engineering at the Johns Hopkins University School of Medicine. "We believe we are the first to investigate the idea of using this concept for implantable medical devices that use direct electrical current, long thought to be unsafe." Implantable spinal cord stimulators and peripheral nerve stimulators designed to interrupt nerve pain impulses were developed more than 30 years ago, but the devices work by interacting with sensory nerve cells, leading to numbness, tingling and other side effects. In a report on the new findings, published online April 11 in Science Advances, the researchers say direct electrical current devices would allow for more precise, preferential targeting of the appropriate pain-transmitting nerve cells, making them more effective for pain suppression and reducing the side effects of conventional devices. Traditionally, direct current — or single-direction streaming electrical signaling — has been considered unsafe for medical devices that deliver electrical stimulation in the body. The continual flow of electrical current results in chemical reactions at the site of the electrodes delivering the signal, causing gas bubbles, corrosion and toxic byproducts to form. All modern implantable electrical stimulation devices use alternating current pulses instead, in which the electrical current switches back and forth very quickly in a circuit between positive and negative voltage. Such rapid pulses allow the devices to interact with the nervous system but don't create the toxic chemical reactions. In 2013, Fridman and his team reported on successful efforts to develop an ionic direct current system, which converts the "safe" pulses like those delivered in the conventional stimulator into direct ionic current that may potentially be applied to the body safely. To find out if the modified system of direct ionic current could be safely used to preferentially target and silence pain-transmitting neurons, Fridman teamed up with pain researcher Yun Guan, M.D., Ph.D., an associate professor of anesthesiology, critical care medicine and neurological surgery at the Johns Hopkins University School of Medicine. When nerve cells receive a signal of pain or other sensation, the signal opens sodium channels and floods the cell with positively charged sodium ions, which positively charge the neurons until the electrochemistry changes enough to inactivate the channels and close them. This change in electrical charge of the neuron is what propagates and sends the signal to the spinal cord and then to the brain to register as a sensation, such as pain or pressure. Each nerve in mammalian arms and legs contains multiple sensory neurons (nerve cells) transmitting pain and other sensations such as touch or feeling to the spinal cord. Fridman and Guan realized that the pain and "feeling" sensory neurons each contained different kinds of sodium channels and that it may be possible to block one kind of channel and not the others to prevent patients from feeling pain but not other sensations. Fridman and Guan's team first devised a computer model to try to predict what happens when researchers use direct current to block the pain signals or inhibit other sensory neurons. In the model they sent negatively charged direct current to the nerves to weaken their activity. The model showed that the sodium channels 1.6 in the feeling sensory neurons were blocked with 670 microamperes, but the pain neuron's sodium channels 1.7 were blocked at only 290 microamperes. For comparison, holding a 9-volt battery to the tongue delivers approximately 2,000 microamperes, causing a small shock. This suggested to the researchers that it was theoretically possible to preferentially target one type of neuron over another, since the channels could be blocked at different levels of current. Next, working with anesthetized rats, they sent direct ionic current into the sciatic nerve in the legs and, using neural recording electrodes, recorded whether this current inhibited the activity of individual or groups of neurons at the spinal cord. In a series of experiments, they increased the current in two-minute increments from 0.1 to 0.2, 0.4 and 0.8 milliamperes. The current at 0.8 milliamperes completely blocked the response of the pain-transmitting neurons. Although signals from the feeling sensory neurons were reduced by 20 percent, they were still active and sending sensation signals to the spinal cord. After the current was stopped, the signal from the pain-transmitting neurons remained blocked for another two minutes, whereas the signal from the feeling sensory neurons quickly came back. 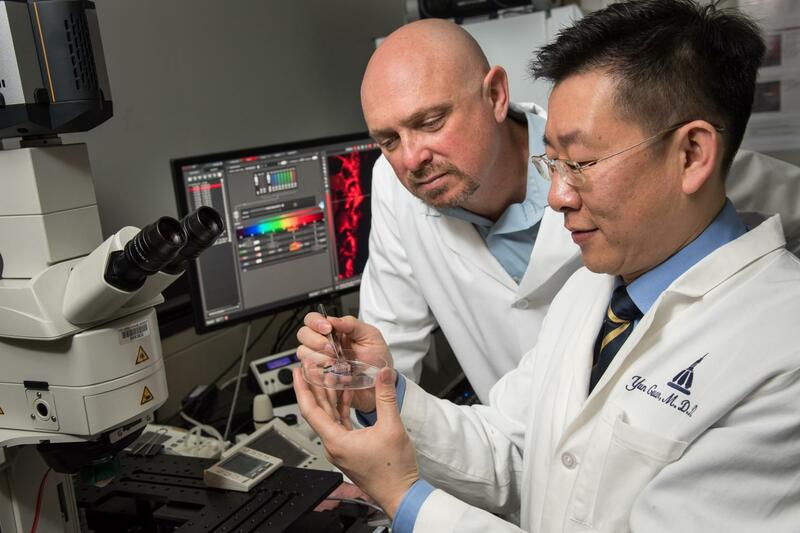 "Using direct current, we can inhibit the pain-transmitting neurons at much lower amplitudes than the feeling sensory neurons, allowing us to be preferential in how we target the nerve," says Guan. "We also found that because the pain neurons take longer to come back on line, we may be able to conserve energy and not have to deliver this electrical current constantly to keep them blocked." Being able to deliver this current periodically rather than constantly would mean longer use of the neural implant before needing to recharge the battery, says Guan. Guan cautions that more studies will be needed to verify safety and measure the strength and duration of pain relief before direct ionic current devices could be used for people. Other authors on the study include Fei Yang, Michael Anderson, Shaoqiu He, Kimberly Stephens, Yu Zheng, Zhiyong Chen, Srinivasa Raja and Felix Aplin of Johns Hopkins. The study was funded by awards from the Neurosurgery Pain Research Institute and the Blaustein Pain Research Fund, and grants from the National Institute of Neurological Disorders and Stroke (R21 NS099879, R01 NS070814, R01 NS092726). Why don't kids use their asthma medicines?